This has got to be one of the oddest G1 Transformers artifacts in existence. 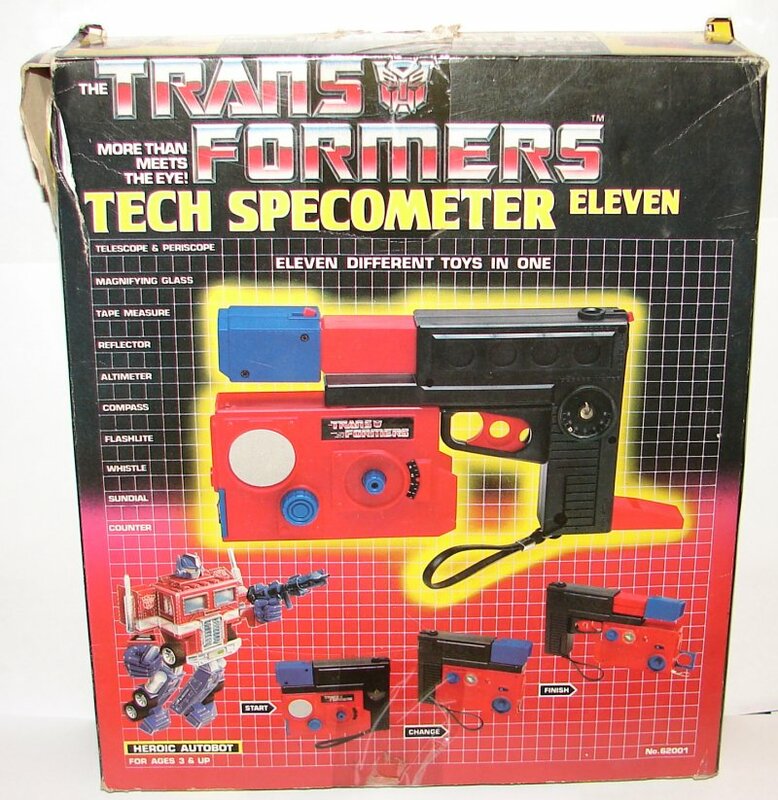 The 1984 Transformers Tech Specometer Eleven. 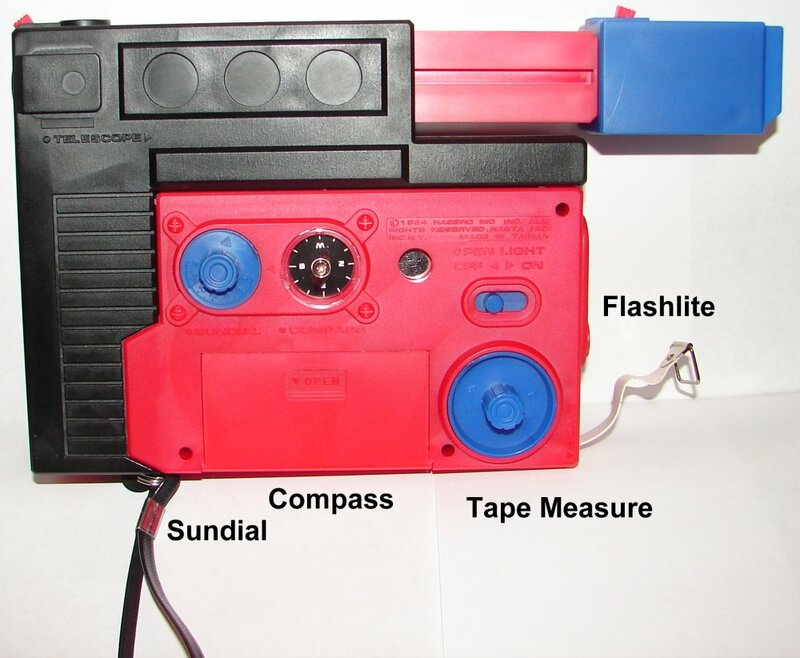 The box claims that it has eleven functions: periscope, telescope, altimeter, whistle, counter, magnifying glass, reflector, flashlight, tape measure, compass, and sundial. Reality is somewhat different. Starting from the top right, we have the periscope. You have to tilt it up 90 degrees from the position in the photo, and look through the lens under the word “Periscope” in the picture. You need to have both of the red switches (on top at the right and the left) in the correct position for the periscope to work. You rotate the blue piece to look in different directions. To use the telescope you look through the lens on the end near the word “Telescope” in the picture. As with the periscope, the red switches need to be in the correct position for it to work. Now things get weird. The box says it has an altimeter, which can tell you the altitude you’re at. There is nothing on it that says that. There is a degree measure. That is the clear plastic disk on the right. There is a metal ball bearing inside. When you pull the red plastic trigger (I call it that for a specific reason, which I’ll get to later) the plastic disk raises up and allows the ball to roll inside. You can roll the ball around to measure out something by degrees, and then release the trigger to hold it in place. Seems pretty useless to me. Not sure how that can be called an altimeter. The whistle is the red plastic and folds out on the right. The counter is two parts. The blue button on the bottom advances it. The small blue knob is used to advance it manually or turn it back to zero. The magnifying glass is on the bottom left. The large blue knob pushes it out and retracts it. The reflector is the silver disk. I suppose it could also double as a crappy mirror. The flashlight actually says “pen light” on the side, but I guess that’s essentially the same thing. There is a slide on the side that let’s you have a wide or narrow beam. The tape measure pulls out from the side, and can be reeled back in with the large blue knob. Oddly, on the side it calls it a “scale”. Kind of odd, not sure what to make of that. It has a small compass. The smaller blue knob on this side is a sundial. So, that’s the eleven things it does. Problem is, they left one out. It is clearly meant to be a gun. I have no idea why they didn’t just put that on the package. It’s not like there was a shortage of toy guns back then like there is now. It just doesn’t make any sense at all to leave it out. In fact, it looks pretty cool as a gun since it looks like it has a huge magazine on it. And that’s about it. I’ve had a loose one for a long time, but just got one with the box. It’s a cool item, I can imagine kids having a lot of fun with this. Not sure where they got the name Tech Specometer, since it has nothing to do with tech specs. 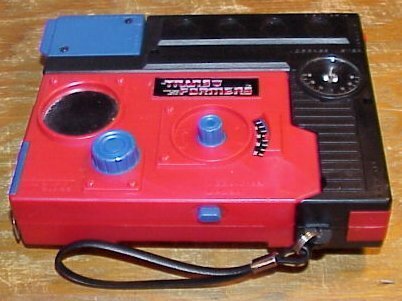 This entry was posted in Toys, Transformers, Transformers Artifact of the Week and tagged G1, Generation One, Tech Specometer, Tech Specometer Eleven, Toys, Transformers. Bookmark the permalink. 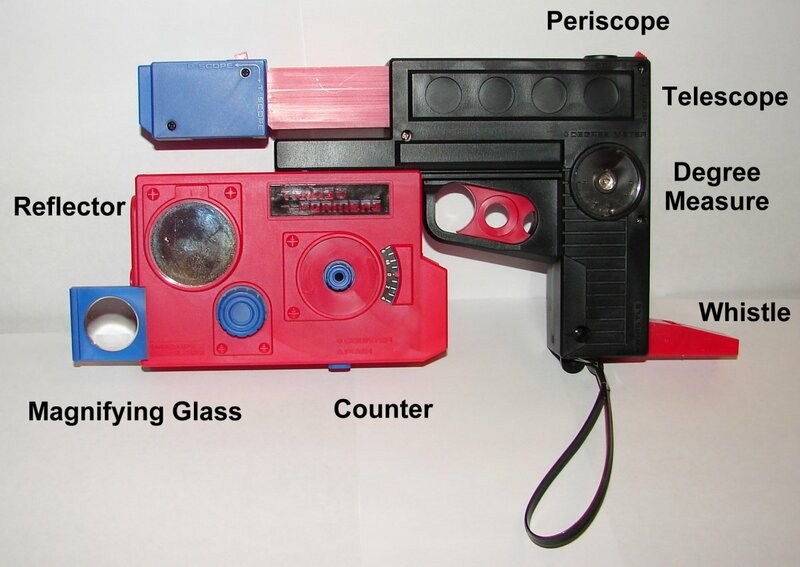 Hah, I had one of these as a kid and thought it had something to do with Perceptor. So I had never been able to find it with Google. 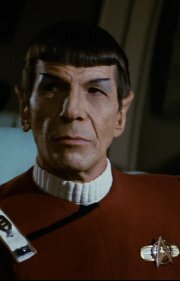 I finally found it in a google image search. I bought my “Tech Specometer” when I was 10 yrs old in 1986. We took and end of year school trip to Six Flags (I lived in a small town 4 hrs away) and to the Galleria. I found this toy in (I think) a Kaybee Toys there at the mall. It was actually probably the last Transformers toy I bought, as I was kinda outgrowning it and GIJOE by then. Plus that confusing movie where everybody died didn’t help my fandom. But I still sat around and fidgeted with the “Tech Specometer” for a few more years just out of a fascination with gadgets more than anything.